This year’s event was held on Dec. 1-3 and broadcast live—by Time Warner Cable Community Channel 9 and Townsquare Media—from the Northeastland Hotel. Auction Co-Chairs Gina LeBlanc-Eggert and Mandy Pooler-Hall and more than 100 Presque Isle Rotarians helped to pull off the 2015 auction, working on everything from taking in auction bids by phone to serving as auctioneers to filming the activity for local broadcast. Funds raised during the event benefited seven non-profit organizations in the region and the auction’s Special Project, Quoggy Jo Ski Center. The 2015 auction featured over 600 items—including 3-night special items, one-night items, half-hour items, and CHAIR-ity art auction items—generously given by more than 190 donors. The total value of these items was estimated at more than $54,000. More than $50,000 was raised for Quoggy Jo Ski Center as the Special Project. That money will help to fund its Safety Project Campaign for Capital Improvements. This effort will address the much-needed replacement of aging equipment and help the ski center to provide safe, reliable and economical winter recreation activities—both day and nighttime—to the children and families of Presque Isle and the surrounding communities. In addition to the Special Project, the annual Rotary Auction raised funds through its regular auction to benefit several local groups. Aroostook Autism Support Group ($2,000) to support the Annual Aroostook Autism Conference 2016, which will bring trainings and resources to Aroostook County, and various vendors and agencies that provide assistance and support to individuals affected by autism. Grace Interfaith Food Table (GIFT) ($1,300) for an upright refrigerator (24 cubic feet) and hand trucks to hold 600 pounds of fresh fruits, vegetables, milk products, eggs and cheese that all need to be refrigerated during a week’s time. Presque Isle Fire Department ($2,500) to give its Fire Extinguisher Fill Station Ventilation Hood System the ability to fill empty fire extinguishers. This will allow the fire department to fulfill its duty to protect local citizens from small fires not requiring a water hose. Presque Isle Historical Society ($2,000) to fund an Education Exhibit to educate the general public, primarily children and youth, as to the rich history of agriculture, farms and specifically potato farming in the area. Presque Isle Snowmobile Club ($2,000) for the replacement of the club’s 6-burner gas range. The club offers its clubhouse to many non-profit organizations for Stew Nights, parties and meetings. Northern Maine Veterans Cemetery ($1,263) for the purchase of 30 5-by 8-feet American Flags to be used to fly 24 hours a day, 7 days a week, May through Veterans Day in November at the cemetery’s Avenue of Flags. St. Apollonia Dental Clinic ($4,000) for the inhalation sedation equipment needed to treat children requiring care for extreme dental disease that would otherwise be referred to Bangor or further south. Another major component of the auction was the annual art auction. The Presque Isle Rotary Club partnered with Wintergreen Arts Center on the effort, with all proceeds going toward children’s programming at the center. Up for bid at the 2015 auction were 15 unique chairs transformed by local artists into works of art as part of the center’s CHAIR-ity Art Auction. 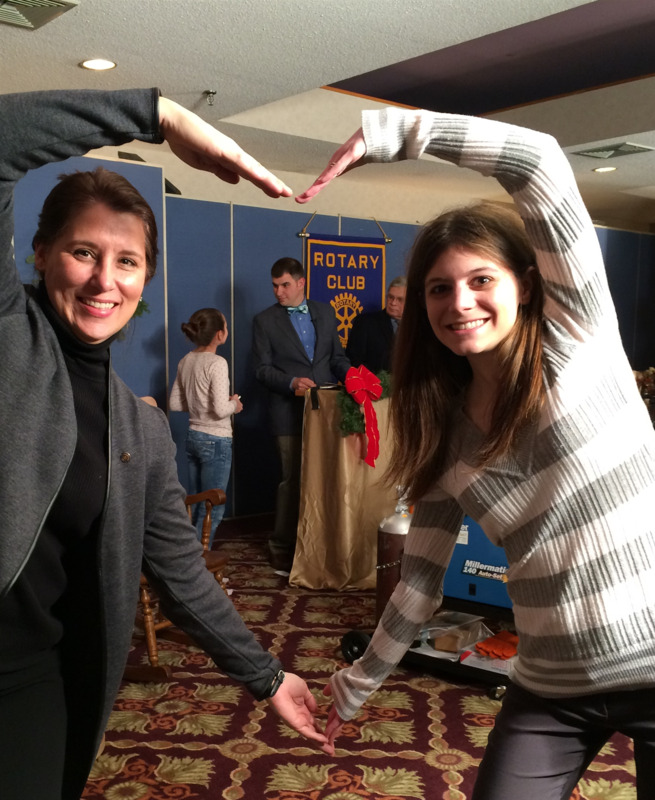 “Rotary Auction week is genuinely my favorite week of the year. It gives all of the Rotarians an opportunity for fellowship with each other and a feeling of comradery as we work towards our goal of raising money for our community,” Pooler-Hall said. “It also gives us an opportunity to develop stronger relationships with our very generous donors and other local organizations. I am so thankful for the support shown by our businesses and bidders for our auction. Without them, we wouldn't have this auction." The Presque Isle Rotary Club maintains a membership of approximately 100 individuals and is part of a world-wide organization of community volunteers. The slogan of Rotary is “Service Above Self” and the club seeks to live up to this ideal by supporting a variety of causes for the betterment of the community. For nearly 70 years, the Presque Isle Rotary Club has undertaken the annual Radio and TV auction as its major fundraiser. The club typically raises about $20,000 from auction items that supports various charities and non-profit organizations. Club members also take on a special project that generally raises about $20,000 each year and previously had raised as much as $220,000 in the case of the County Dialysis Center and $377,500 last year for the Presque Isle Community Center. To learn more about the club, please visit www.presqueislerotary.org. With the 2015 auction completely wrapped up, club members already are beginning preliminary work to prepare for the 2016 auction, which will be held Tuesday to Thursday, Nov. 29, Nov. 30, and Dec. 1, 2016.